How Do We Handle the Blessed Bread? You are here: Home / Learning Orthodoxy / How Do We Handle the Blessed Bread? Upon receiving Holy Communion and/or at the conclusion of the Divine Liturgy, it is customary for all those who participated in the prayer of the Church to come forward to receive a piece of “blessed bread” as a sign of thanksgiving. While the bread that is distributed is not consecrated, it is blessed and as such, it should be consumed carefully and respectfully. 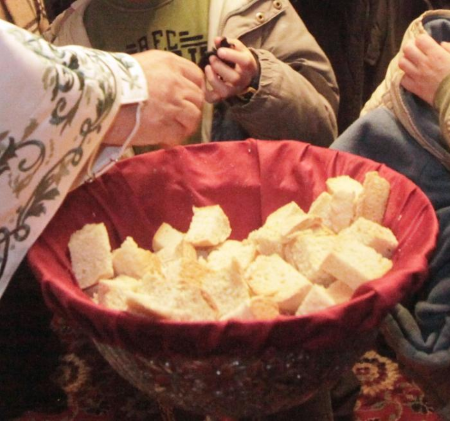 Everyone that attends Divine Liturgy, Orthodox and non-­‐Orthodox alike, may receive the blessed bread as an expression of love and Christian fellowship.